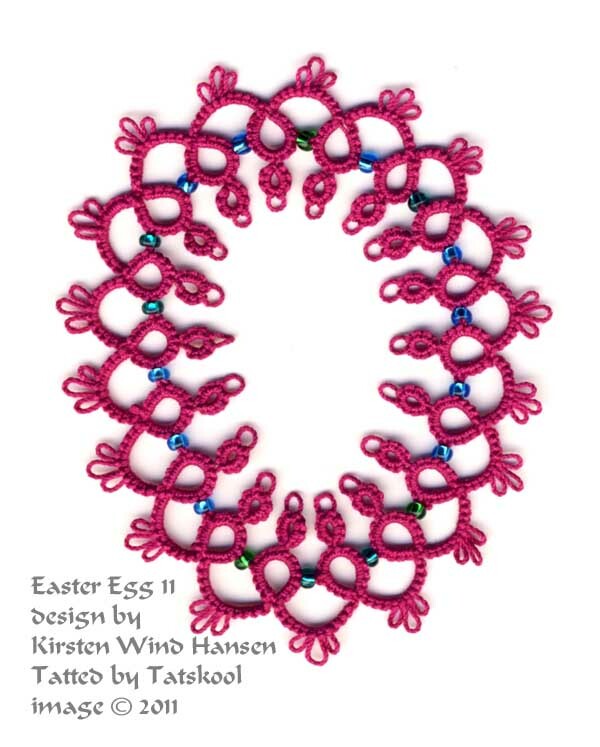 TATS A KOOL CHALLENGE: Easter Eggstravaganza 11! 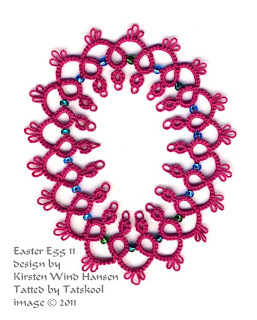 Your tatting is so precise that each motif (egg, critter, edging, what-have-you) looks lovelier than the last. I am undone! OK, here is the one I'm working on now. Have never put beads on this way, so wondering how to do it that is best. On the picot where the bead goes, do you go ahead and put the bead on and then put s clip or something there to make sure it's the right size? That is what I'm doing right now on my first one. A small paper clip is what I'm using....already trying to think if I have knitting marker that would work better...hm! It's very easy once you get used to it. I don't leave a marker on or even use one. I just make sure the picot is big enough to get the bead on and keep my crochet hook inserted to make the join. Then make all the other joining picots the same size either by eye or by picot gauge. Keep the picot size as small as you can to get a snug fit.